Although Matera is not in Puglia, but rather in the neighboring region of Basilicata, visits to the ancient city are frequently part of independent and organized group tours of Puglia, so it’s worth reporting news about it here. Its proximity to the city of Altamura, near the center of Puglia, makes Matera easily accessible for Puglia-based day-trippers as well as those wishing to stay longer. 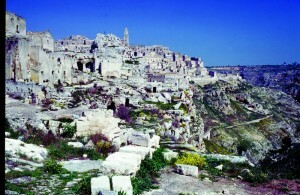 In an online article titled “Why the City of Matera Is Italy’s Hidden Treasure,” the website vogue.com offers a photo essay about the increasingly popular destination, which has been designated as one of the European Union’s two “Capitals of Culture” for 2019. The article states, “Strikingly beautiful, Matera is poised to become Europe’s next best destination‒so visit before it gets too caldo under the Italian sun.” Well worth seeing if you’re so close by. Click here to see the entire post. You are currently browsing the Puglia Connection Blog blog archives for January, 2016.